Setting Intentions; You may bring crystal(s) or small personal objects to set your intention and also have them with you during the workshop to anchor the healing experiences. 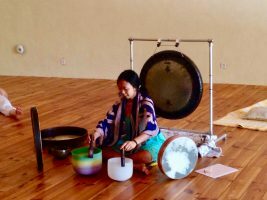 Sound Journey;You will receive a healing Sound Journey with gong, crystal bowls, drums and voice by laying down. Lavender eye pillows will be given if you wish. During this journey, you will be laying comfortably on yoga mat and given eye pillows and throws. Allow yourself to receive the healing sound vibrations. Whether you’re asleep or not, your body is still receiving the healing benefits. ?Gongs have claimed to have numerous benefits on physical, emotional and mental health, providing a balance in our wellbeing.Tachyon Soulprint; is a recent Healing modality developed by San Lau to facilitate wellbeing on all levels possible. It incorporates sacred geometry, toroidal energy and sound through connection with our unique Soul Blueprint. Sound is vibration. We are 75-80% water, thus the sound vibrations go through our body through our body fluid to create healing by altering our cellular molecules on an atomic level! During the last part of the session, collective healing will be sent to the entire group. Torodial Touch is individual hands on/off healing which is offered to those who wish to receive. During the healing, Toroidal energy is sent to the receiver and it aims to replace dysfunctioning limiting beliefs associated with the body area(s) with functioning and healthy beliefs and emotions.